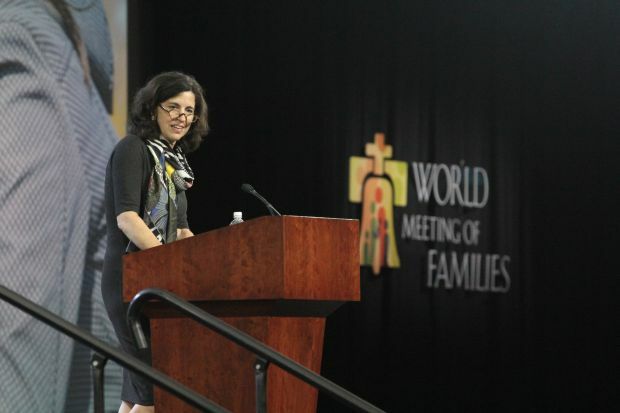 Beyond doubt Helen Alvaré, who spoke on the topic “Creating the Future: the Fertility of Christian Love” at the World Meeting of Families, is an expert on marriage and life issues. 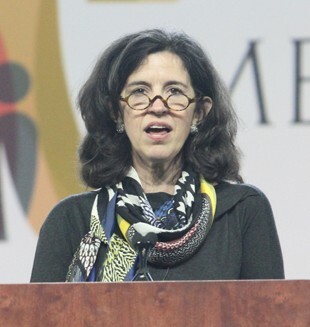 A law professor at George Mason University, she is a consultant to the Vatican and the American bishops in this field, and has been a recognized defender of Catholic teaching on marriage and the family for many years. She is also a wife and mother. It wasn’t always so. She remembers at age 10 or so, in conversation with her own mother, who in college had been first in her class and an accomplished musician, exclaiming, “Wow! You could have been something,” not yet appreciating her mother really was something — she was a loving wife and parent. “I was rooted in the Gospel of Me” Alvaré remembers. With new eyes, she witnessed her parents taking care of her disabled sister, taking care of their own elderly parents, her brothers and sisters caring for their children and the examples she saw in her parish. She has witnessed that Gospel of Me taking deeper hold in recent decades. As a Catholic feminist herself, she has regretted seeing the issues of contraception and abortion becoming a sine qua non of women’s rights. A common example of the joy of marital sacrificial love comes at the beginning of parenthood.